More than two years ago, I posted Finding large emails in Gmail using Python IMAP with XOAuth, which was really not an easy way if you don't know how to run a Python script. It also supports date ranges, no need to browse through pages for old emails anymore. It's fast, only took than more than two years to develop. du -sh is one of the common ways which I utilize du command, I used it to get the total disk size of current directory occupied. Another one is du -hd1, getting the disk sizes of each subdirectory uses, it lists one by one instead of a grand amount. After I posted about using Googles Python XOAuth library to get the unread mail count and list, I finally found a good reason to use IMAP, you can search based on the message size! Which you cant do in the web interface. That is just great but not awesome because Gmails IMAP server does not support SORT command, which is an IMAP4rev1 extension command, according to Python doc. # How many messages will be fetched for listing? Larger than in KB ? Smaller than in KB ? 23 messages are between 1000 and 5000 KB. The search would take quite a lot of time to complete, up to minutes. So, please be patient. I want to find those big emails because I couldnt figure out why 9,085 emails can take up to 543 MB in my Gmail. 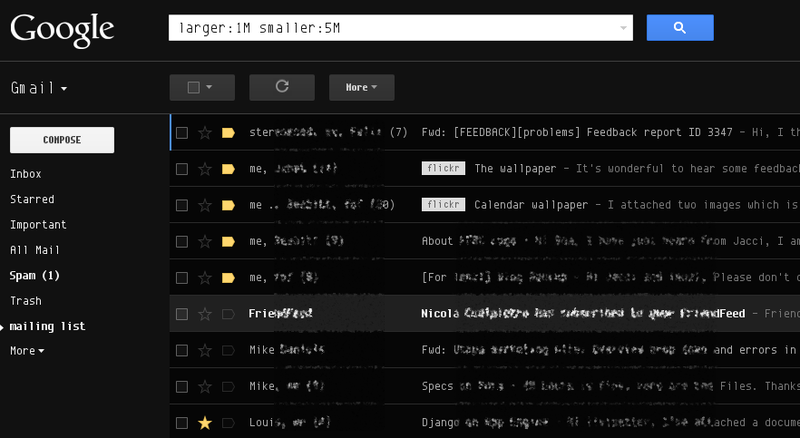 I found the biggest mail, 15,189KB, 2.80% of used space. Second and third takes 9,366 and 7,659KB, together take 3.14%.